Greenkeeper helps keep your software up to date. This eliminates many security concerns and compatibility issues, and also keeps your projects fresh and maintainable. It provides a constant drip of small, isolated updates that can be easily understood, tackled and tested. Greenkeeper automates away unpopular and time-consuming developer tasks: staying up to date with a never-ending stream of releases, and testing each one’s compatibility with your software. Greenkeeper integrates seamlessly into existing workflows, so there’s nothing new to learn, and you can save time and money with minimal overhead. 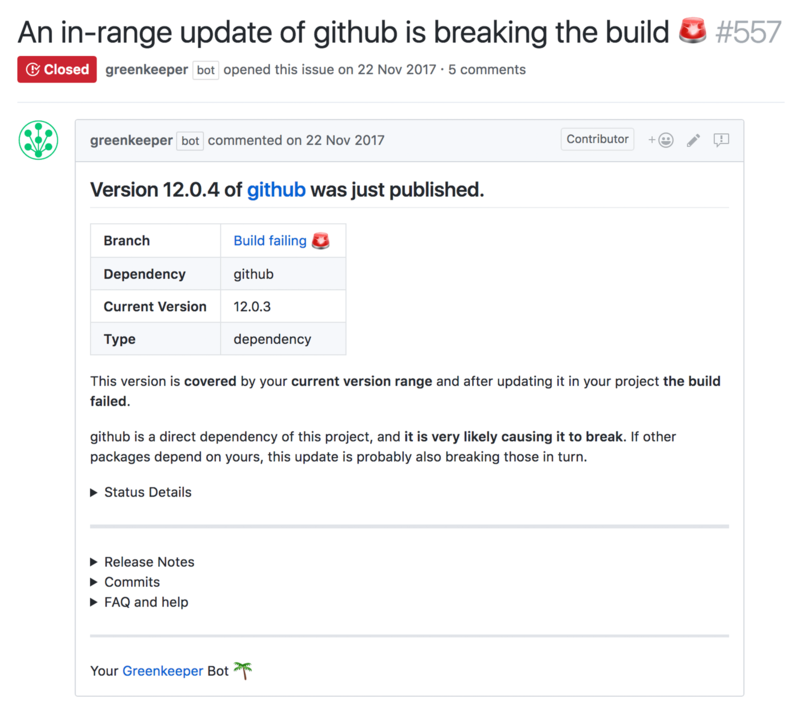 Greenkeeper Enterprise is a self-hosted solution for GitHub Enterprise users. It is secure and wholly under your control, and supports any private module repository your company may be using, such as npm enterprise, jFrog Artifactory and many others. Our software-as-a-service version of Greenkeeper has been around since 2015 and has thousands satisfied users, including many large companies you’ve definitely heard of. We’re an independent German SMB without external shareholder interests, so we’re in it for the long haul. If there should be problems, we provide competent and friendly support. To self-host Greenkeeper Enterprise, you’ll need a Linux server with a minimum of 2 cores and 4GB memory, running an operating system from this list. Its ports 80, 443, and 8800 need to be accessible from your local machine. To get a better idea of what’s involved, please take a look at the Greenkeeper Enterprise setup page.